form a quantity; build up. 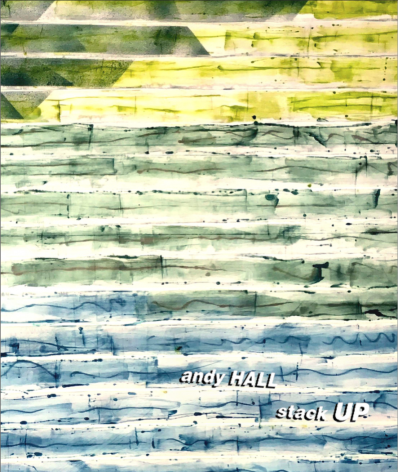 Geary Contemporary is pleased to announce the solo exhibition of recent work by Andy Hall entitled Stack Up. This exhibition is the second solo exhibition of Andy Hall’s work at Geary Contemporary and will include large scale works of dyed and ink drawn silk referencing and incorporating Andy’s current focus on dimension and space. The exhibition will be on view from March 18 - April 23rd with an opening reception on March 17th from 6-8pm. Hall’s work extends the long history within his practice of invention through materials and processes. 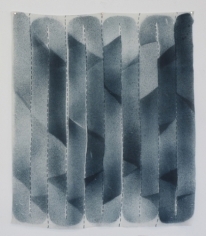 In dialogue about the work, the artist reflects: “Silk for me is a way to expand the story of a given material, one of the oldest traditional materials.” In addition to silk, Hall will be exhibiting systematic drawings which seek to outline the subjective and abstract nature of mathematical distance. His collective works reflect sustained material curiosity and the exploration of ideas through form. Andy Hall (b. 1972, Kansas) Select exhibitions and projects: The Museum of Contemporary Art, Chicago; The Soap Factory, Minneapolis; Contemporary Art Museum, Raleigh; American Craft Council, Minneapolis; LACE, Los Angeles; Chicago Cultural Center; Gavin Brown Enterprises, NYC; Art Museum, Memphis. Reviews and features in the Chicago Tribune, The Durham Herald Sun, The New Art Examiner, Anp Quarterly, Artsy, Public Art Review, Interior Design Magazine, Core77. Hall is Assistant Professor at the School of the Art Institute of Chicago.